Do the words “gate design” immediately conjure images of curlicued, wrought iron wonders worthy of Buckingham Palace? Now what if your aesthetics veer more towards modernist lines, cast-in-place concrete, and overall minimalism? Then make your gate design match your home style. 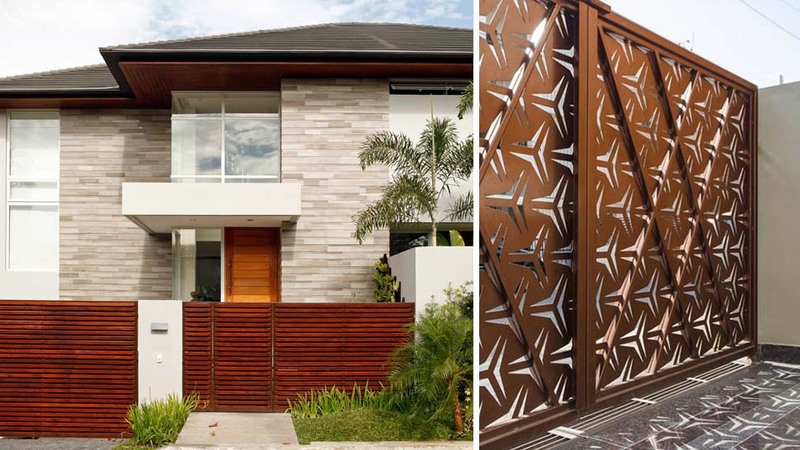 Check out these sleek but highly creative gates by various manufacturers and designers that are anything but boring. The interlocking lines and curves of this gate by @bilalirsheid_interior are playful and elegant at the same time. The repetitive simplicity of this gate/fence in India by Garg Architects emulates the block-style massings of the house design. A staggered pattern of linear cuts plus brick-finish posts gives this Vancouver gate an Arts-and-Crafts-era appeal. Intricate but sharply modern patterns can work for a modern-minimalist house. Check out these laser-cut patterns that cast interesting shadows on the driveway. Translucent or frosted glass insets add a delicate, glamorous quality to the wrought iron gates of this UK home. Horizontal wooden bands on a gate make a straightforward and simple design statement (try this for a Japanese-style or tropical-modern home). The diagonal lines and eye-catching black frame create a dramatic first impression for this designer gate. To see more pictures of the house in the main photo above, click here.